Politico reports that President Trump’s phones don’t get regular security check-ups, despite the fact that his iPhones are a huge target for hackers around the world. Trump’s Twitter phone has gone for as long as five months without a security assessment, which is obviously against the advice of White House staff in charge of protecting his communications from hackers. As Politico notes, President Obama regularly handed over his phones to check if they were compromised. But for some reason or another, Trump doesn’t like to do it. 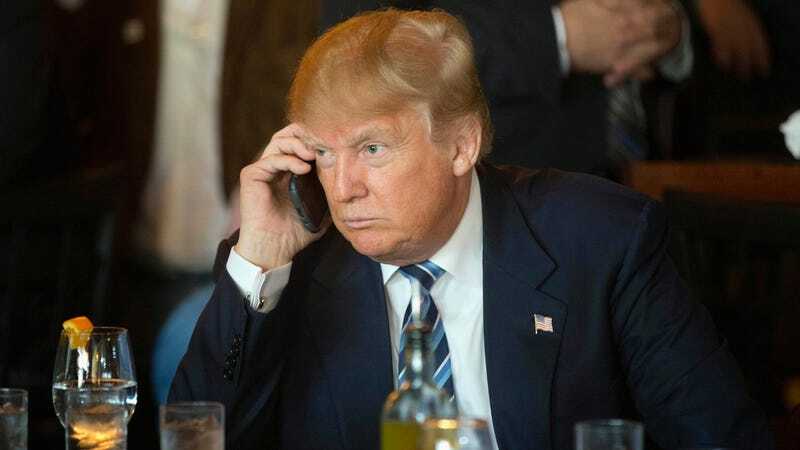 The White House says that aides carry secure phones from which the president can make calls, but Trump is known for making early morning and late night calls on his unsecure phone—a phone that also has a microphone and camera, two incredibly valuable tools for any hacker who wants to monitor what the president is saying and doing. And fears that people in the White House could be hacked aren’t unfounded, as we’ve seen from people already inside the West Wing. The White House believes that Chief of Staff John Kelly’s phone was compromised last year, though it’s unclear who may have been behind the attack and what, if any, data was revealed. Trump doesn’t have any phones capable of email and has probably never used a computer, as far as we can tell. But it’s no secret that he loves to tweet, and still uses iPhones, despite promises to boycott Apple products in the past. President Trump is notoriously paranoid about everything from germs to people poisoning his food. So it doesn’t make much sense at first glance why the president would be so unwilling to hand over his phone for proper security checks. Unless, of course, the president believes that his own staff is out to get him and would snoop on his Twitter phone (which is also preloaded with news sites) to put him in a vulnerable position. The irony, of course, is that he has so much to lose from state actors like China, Russia, or North Korea knowing about his thought processes. Especially as he enters into high-stakes negotiations with China about trade and even higher stakes negotiations with North Korea about its nuclear arsenal. President Trump often thinks that he knows best, no matter the subject matter. But when it comes to technology, he’s truly putting the country’s security at risk with his phones. In fact, we can probably expect an early morning tweet any minute now about how Politico’s report is “fake news,” giving foreign adversaries a glimpse at patterns like when he’s awake and what he’s thinking. But none of it will matter. At this point you either believe President Trump or the news media that cover him. Reality doesn’t have much bearing on anything in American politics anymore.